This sword has been discontinued and is no longer in production or available, but is preserved on the site for informational purposes. 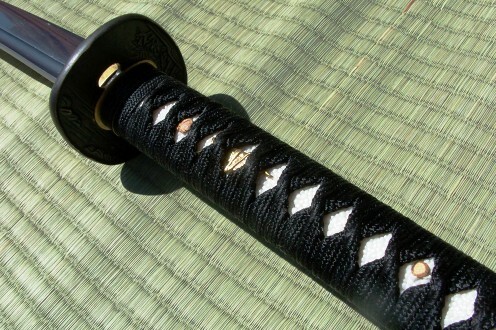 Half-decent cutting Samurai swords on the market under $300 are pretty common these days. Most are through hardened monosteel Katana variety  tough, heavy duty things designed for the rigors of test cutting. 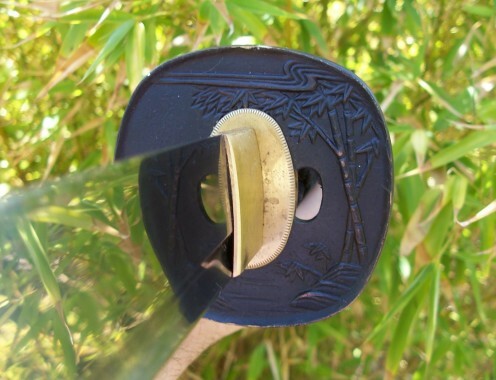 But when it comes to traditionally made, differentially hardened blades -  there honestly really aren't all that many blades worth considering.. While the Ko-Buke from Valiant Armory was a (pardon the pun) Valiant attempt to close the gap and provide a real Katana at this price point, it didn't quite succeed (though it did come quite close). And while these swords are discontinued, this review is still a good insight and a guide on why it pays to be careful when trying out a new unknown product..
Valiant Armoury specialize in medieval swords, and darned nice one at that. But their attempt to break into the differentially hardened, sub $300 market didn't quite take off as expected. The world of the Katana and that of the medieval sword are poles apart, and in the end they decided they could only focus on one type of sword - and collectors of medieval swords are probably glad they did..
And lovers of Japanese swords are probably glad that this thing didn't represent the pinnacle of sub $300 authentic hamon samurai swords! Ok, well - it wasn't ALL bad.. It actually started kind of well. The plain box was nothing special, but the sword bag looked kind of nice. Definitely a nice touch, the photos do not do it justice. Unwrapping the bright red cord, I took the sword out and spent a few moments taking it all in. The deep and rich blood red red saya certainly looked very bold and eye catching. The Sageo (cord around the saya) was a nice surprise, the same kind of thick functional stuff Cheness uses instead of the just for show shoelace rubbish you normally see. Indeed, so far so good.. But..
At first glance, the fittings looked ok. It looked like the glue used to fix it had lost it's grip. No big deal if caught early, a little gorilla glue should hold it back on, but I lost a lot of confidence in the ito and tsuka at that point.. I was still grumbling a bit about the kashira when I looked at the tsuba. Pretty basic, powder coated brass - which is ok, but it was very generic and did nothing to excite me. The Seppa were decent - better quality than the more commonly used wheel cog things. But in short, I was not impressed by the fittings at all, and it proved impossible to disassemble so I don't know if it was just jammed on way too tight or if it was glued in (if it was glued in, they should have used that stuff on the kashira!). I hoped the blade was good..
Made of 1095 carbon steel and differentially hardened, the blade offered some promise. Some say it is a bit of a brittle steel to make a Katana from, others say it is fine as long as you don't abuse it and better approximates a real Katana. Either way, visually - the sword was starting to redeem itself somewhat. Now this wasn't a bad hamon! I don't think it as intentional, but it had a hamon that reminded me a of a laminated blade. Very attractive. But it was not, to be honest, all that prominent. From almost all other angles it was invisible - and while a hamon SHOULD shift in and out as you look at it from different perspectives, you should see it more than once.. But this hamon was only really clear from one angle (the one in the photo, which took quite a few shots to capture). 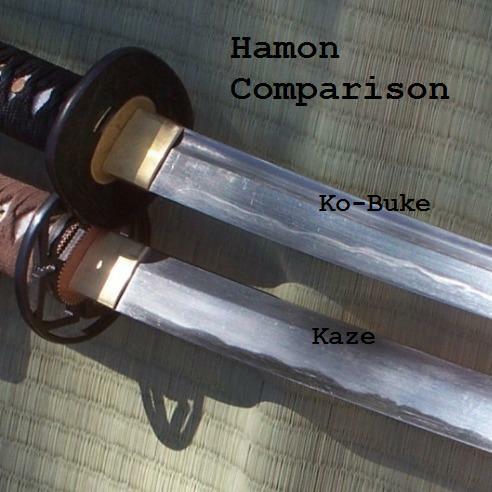 Compared side by side with the Cheness Kaze, which I have also previously described as having a rather subtle hamon  the Kaze Hamon tends to be visible from all angles and is around 3-5 times more defined than the Ko-Buke - as you can see by the pics below where I have tried to capture them side by side. The polish was also a lot rougher than the Kaze - using my special 'flaw finder' lens you can see many more marks on it than the Kaze - and you can also see the contrast is much weaker..
By that I mean it felt completely blunt. I considered throwing in the towel at this point. But I had come this far and spent half an hour trying to capture a half decent photo of that hamon, so I might as well press on. Japanese swords are not very sharp. Usually their blades are bevel ground with full "meat" on the cutting surface, so the angle of cutting edge is large. The angle of cutting edge is different on each of these tools. They are designed for a specific purposes. A razor is very sharp, but can't cut down a tree. 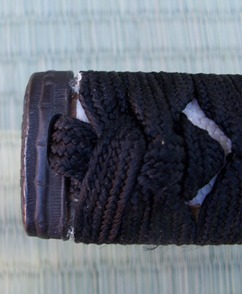 Japanese swords are not very sharp, because the object being cut is not always a straw man. Maybe it was one of those. 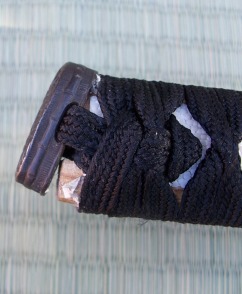 Going into the tests with a Kashira glued on the night before and what I felt was a completely blunt sword did not exactly fill me with confidence..
As I set up a variety of targets designed to really test its raw out of the box cutting ability, I really thought that I was going to have some serious trouble. I thought that it may well struggle on a water filled bottle. I was pretty certain that it would not make it through a flimsy pool noodle  which are notorious for flip flopping out of the way if the blade cant get up to speed and does not have enough of an edge to bite when it needs to bite. And as far as Tatami Omote mats go, to be honest I had no idea how well or how badly the sword would perform. And then it got weird.. The sword cut everything pretty well..!! I was kind of shocked. The blades geometry was doing all the work. Here was a sword I could rub on the palm of my hand without fear of it cutting me, but slice it through the air and it seemed to miraculously transform.. It was at that moment, that I realized that I had a LOT to learn about the more advanced dynamics of a good cutting blade than mere apparent sharpness - and for that alone, it was worth the purchase price..! It proved a difficult sword to evaluate and sum up. In some ways, it's awful - the saya is attractive enough, but the rest of the fittings are well below average. The hamon was hard to spot, but at least I knew it as real and it was there. 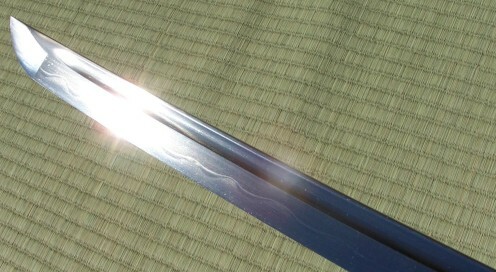 The blade was completely blunt to casual inspection, but it cut tatami like a pro! Commercially of course, these factors plus there already being better choices at the time and it's plain appearance cosmetically doomed the Ko Buke to failure. But I thank it for the lesson on blade geometry!